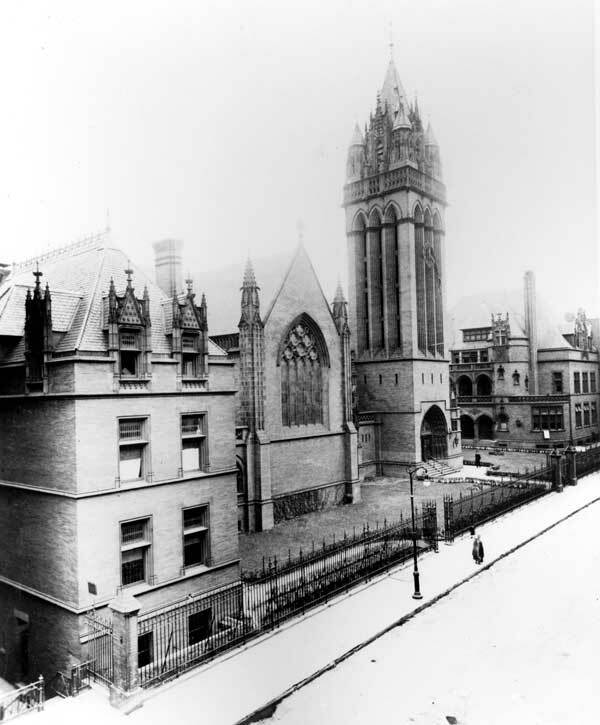 "To come upon this verdant treasure by accident is one of the city's greatest experiences..."
The church complex is a parallelogram with 150 feet frontage on 88th Street and 100 feet in depth, the equivalent of 11 full city lots. Serena Rhinelander also bought and donated a small rectangle on the southside of the parallelogram towards 87th Street to accommodate the south transcept and permit the church being set back from the street, leaving space for lawn, trees, shrubs and flowers. This garden area was, the New York Evening Post wrote in 1899 "in effect, a park for the surrounding tenements." J. Stewart Barney of Barney and Chapman was selected as architect. The basic scheme of Holy Trinity is similar to that of the Grace Mission complex at 414 East 14th Street, which Barney had designed a few years before for William R. Stewart, Serena Rhinelander’s nephew. Barney wrote "I tried to combine the repose of the English church with the picturesque dignity and beautiful detail of the French, using on the church detail distinctly ecclesiastical, but throwing into St. Christopher's House and the vicarage more of the domestic feeling of the period." The complex is framed on the east by the rectory and on the west by St. Christopher's House, the parish house. In each of them there is a suggestion of the architecture of French chateaux, complementing the more strictly ecclesiastical French Gothic of the church itself. The whole complex is effectively united by a cloister which enables one to walk from one end to the other without going outside. The cloister connecting the parish house to the church is punctuated by the protruding polygonal apse of the morning chapel. The material of all is long and narrow mottled golden-brown brick known as iron-spot Roman brick (specially made for the complex) with slated roofs of deep red tile with copper cresting. There are 3 large crosses on the roof and terra cotta sculptures grace the facades. The architecture of the church is French Gothic style of the 13th century which emphasizes verticality and translucency. The pinnacles accentuate the upward-pointing movement on the exterior and the flying buttresses contain the outward pressure of the vaults so that when inside one does not see the heaviest members of the structural skeleton. The high, open bell tower, 20 feet square and 150 feet high, rises exactly in the center of the parallelogram. Though of such large size, the tower does not appear heavy, as its long sides are accented vertically by open belfry slots consisting of deep concentric Gothic arches, and the ornamentation upon it is delicate and graceful. At the top are an exuberant profusion of molded terra-cotta sculpture: finials, fleurs de lis, gables, turrets, and 15 gargoyles symbolically standing watch. And the tower is crowned by a simple eight-sided spire. The solid lower stage of the tower is relieved by a richly ornamented doorway. The recessed main door is flanked on the left by statues of Ezekiel, Jeremiah and Isaiah, and on the right by St. Peter, St. James and St. John. In the center of the door the central post has a niche with a figure of Christ. Above is a tympanum with a bas-relief of Christ commissioning the eleven apostles to teach and baptize with the legend "Go ye, therefore, and teach all nations, baptizing them in the name of the Father, and of the Son, and of the Holy Ghost." Matthew 28:19. Walking into the church, one is struck by the magic of its interior space—the warmth of the dark brown terra cotta supporting and setting off the brilliant and graceful stained glass windows soaring up to the stained oak open vaulted ceiling. At the time the church was built, terra cotta, which is baked clay, was just beginning to be used extensively as a construction material. It is extremely durable and plastic. Here it is designed to look like ashlar brownstone, a finish unprecedented in American architecture. The high altar of Caen stone was given in 1915 as a memorial to Serena Rhinelander along with the bronze reredos which replicated in bronze the original reredos of wood that had been executed by Karl Bitter. Next to the Chancel in an alcove designed for the purpose is a baptismal font of white Caen stone, a memorial to Muriel Stewart the only daughter of William Rhinelander Stewart, the nephew of Serena Rhinelander, who died at the age of 2. Under a richly decorated, traditional Gothic canopy is a beautifully carved figure of an angel holding a large sea shell as a receptacle for the water. The baptismal font was the work of Karl Bitter and installed soon after the church was built. 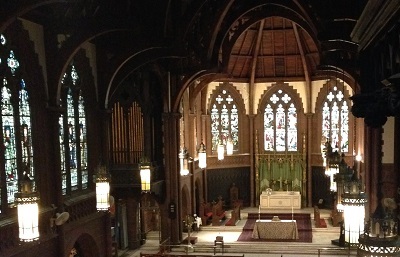 Located in the north transept, the Memorial Chapel was given as a memorial to Alice Hoyt Dominick by her son and dedicated by The Rt. Rev. Horace W.B. Donegan, D.D. on Sunday, October 28, 1956. The altar was designed in New York and executed in Italy. The pipe organ in the south transept was designed and constructed by Rieger-Orgelblau of Austria and installed in 1987. Breaking artistically along the long line of the cloister between the Parish House and the church is the morning chapel about which Barney wrote: "[It] was suggested to me by the beautiful chapter houses of the English cathedrals, and is the connecting link between the consecrated church building and St. Christopher’s House which is of a secular nature." In 1966 the morning chapel was renovated with windows by Robert Sowers and a cross and candlesticks by Daniel Jackson. The stained glass windows in the chapel are opal glass composing translucent mosaics with an admirably harmonious, prismatic play of colors. St. Christopher's House looks like an elegant French Renaissance chateau. It both complements the French Gothic church and is an effective terminal feature on the west end of the complex. Three large arches grace a recessed ground-floor porch. The porch is repeated on the second story, while steep roofs intersected by pinnacled dormers rise above the third-floor facade. An interesting decoration on St. Christopher’s House is the sculptured figure of the saint for whom it is named, placed high up on the outside of the circular stairwell. He is represented in the traditional way, carrying the child Christ on his shoulder and leaning upon his palm-tree staff. The cockleshell ornamentation on the facade symbolizes St. James in honor of the original connection with St. James Church. In 1958 an addition was built extending St. Christopher’s House northward to provide 3 new floors of offices and a modern kitchen in the basement. The alteration was designed by Frank and Walter Eberhart and is a remarkable contextual work, with carefully chosen brick laid in criss-cross patterns, custom-molded terra cotta and a soaring chimney stack. On the extreme east end of the complex is the rectory with room for the rector and his family and originally intended also for several unmarried clergy or deacons. The 3-story parsonage, also French Renaissance in style, is notable for its relatively plain exterior walls, which contrast with elaborate gabled dormers, pinnacled terminations, an elegant main entrance and ornate bronze crestings. The treatment of the recessed center is notable. The first story has a low arched entrance which is effectively abutted on one side by the stark mass of a chimney and on the other by a round turret. On the second story the recess is maintained as a parapetted balcony which above the plane of the wall is continued in a heavy machicolated cornice. Nothing could be more picturesque. To read about possible rectory preservation, click here. 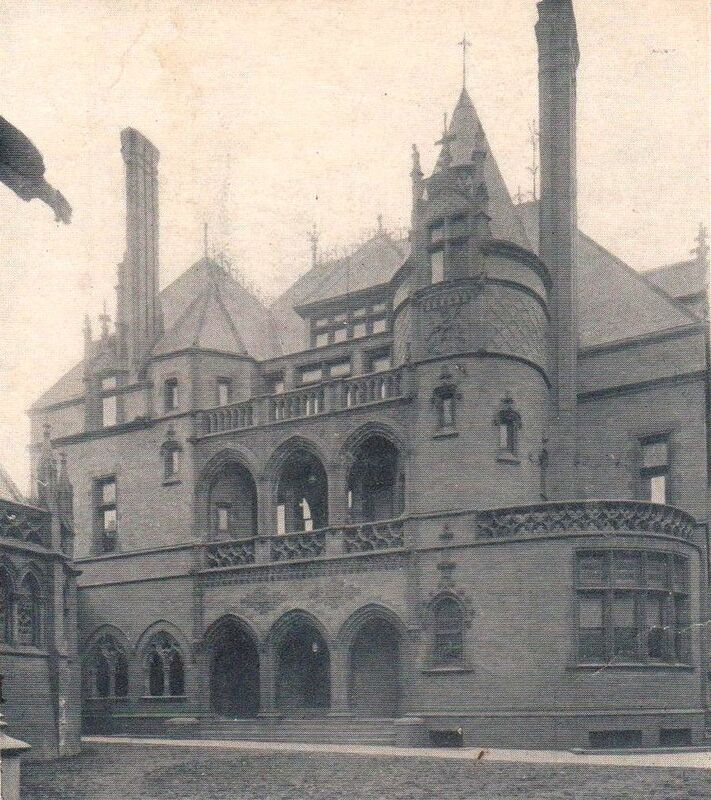 The final gift of the Rhinelanders in 1920 was Holy Trinity House at 341 East 87th Street. The existing smaller building was replaced in 1928 with one providing 3 floors of clergy housing, an oak paneled choir room, offices and an entrance to the church on 87th St.